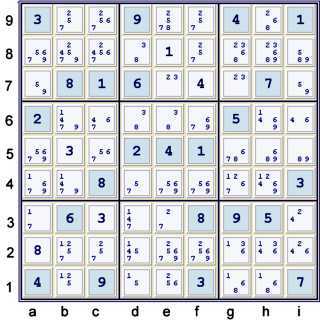 Many places with tips, tricks, techniques or help on how to solve sudoku puzzles that tackle forbidding chains fail to contemplate the next logical step. By example, we are going to do just that. Let us try something newfangled. 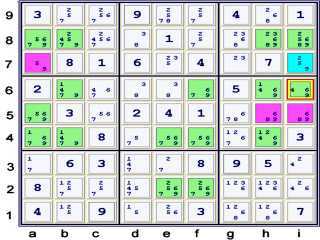 The following is a complete proof of the Tough puzzle of January 19, 2007. 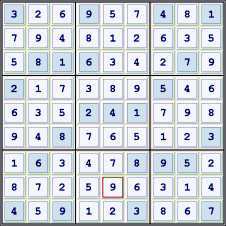 There are other ways to approach this very tough puzzle, but the following is the least deep that I could find. If this is your first visit to this blog, you may need to study previous blog pages first. Links to these pages are to the right under Previous Entries It is assumed that you understand the terms used here (see Definitions> and that you understand the general idea of forbidding chains (see Forbidding Chains 101 The Theory). Note that cells hi5 and cell i7 both see cells i46. Of these, only i6 contains a potential 9 for elimination. 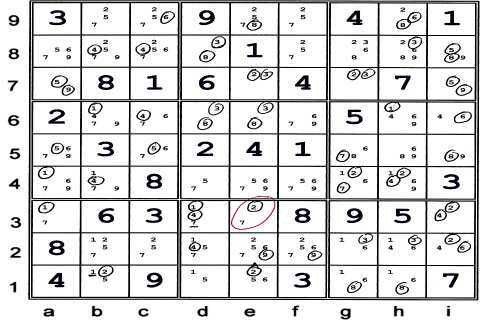 At this point, I can find no more easy eliminations, so I print out the puzzle and mark it as noted in the previous blog, Forbidding Chains 102 The Practice. Typically, while marking up the puzzle I will make some notes as to points of interest in the puzzle. With the marks above, I noted that the 2 at e1 sees two very strong cells and is the endpoint of multiple strong links, so it probably will be part of a chain. I also noted that the 1 at b1 looks like an easy target for elimination, as it is seen by two strong cells and the endpoint of a strong link. The 7 at d3 is similar, but as it turns out is more problematic. The cell e3 seems very likely as part of some chains to me. This conclusion is deduced from a short study of the mark-up. Thus this argument works perfectly well as a Boolean variable within the chain. 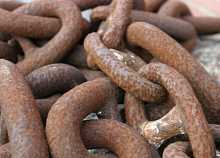 Given this new theoretical tool, there are dozens of forbidding chains available. I cannot possibly list all of the ones that I find here becuase it would just take too long. You may very well find a better, quicker way to solve this puzzle than the one that I will illustrate. This new theoretical tool is one of many reasons that I like to use forbidding chains instead of other solving technqiues. With this new tool, one can use all techniques inside of forbidding chains. This makes for one powerful tool! The key to this chain is noticing the strong 4's in box h5 conspire with the two's to constrict the one's. This yields the forbidding chain shown. Note it is a wrap around chain, thus all the candidates circled green that lie on a weak link are forbidden, as all the weak links are now proven strong. 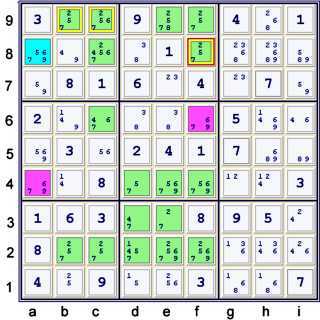 Start at 23 filled - the given puzzle. Unique Possibilities to 27 filled. (UP 27). Rating: 3(.01)+6(.03)+3(.07)+.15+1.27 = 1.84 Truly tough! Thanks for this work, Steve ! Your most certainly welcome, fellow Sudoku Addict! I guess I don't understand everything yet, but in the above solution, part of it states that i6=4 == h4=4, which I thought meant that one of those had to hold true. But the final solution shows neither i6 nor h4 = 4?